The Ergo Lite transit wheelchair will make sure the user is comfortable and safe. Its ultralight frame is made from aircraft grade aluminium alloy using cutting-edge manufacturing processes. Price excluding VAT.(Incl. VAT £474) *VAT Relief available on this product. 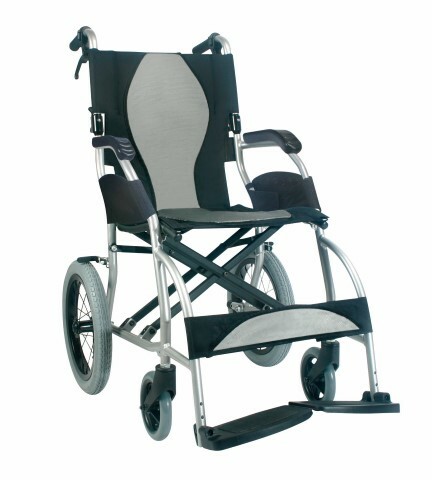 The Ergo Lite transit wheelchair will make sure the user is comfortable and safe. Its ultralight frame is made from aircraft grade aluminium alloy, using cutting-edge manufacturing processes. Weighing in at just 8.3 kg, the Ergo Lite gives you one of the lightest wheelchairs on the market at a fantastic price. For whoever is tasked with pushing this transit wheelchair, it is equipped with a 3 staged braking system which makes it easier to slow and stop the wheelchair. The features on the Ergo Lite include the highly popular S-Ergo seating system which promotes pressure redistribution but minimises the risk of sliding from the seat. The half-folding backrest enables you to easily fold the wheelchair for storage or further travel. Aegis microbe shield fabric helps to prevent the growth on textiles which keeps the fabric fresh and odour free for longer. Despite its lightweight qualities, this wheelchair is exceptionally strong. It has a double cross brace frame making it sturdy enough for users up to 100kg (16 stone) in weight. The Ergo Lite has a contemporary feel, thanks to its two-tone upholstery and comes highly recommended by Cavendish Health Care.